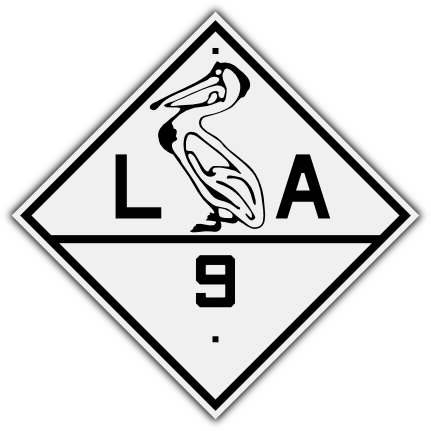 Louisiana shield with MUTCD fonts. City route U. S. shield, run off on an old press using the original dies. These markers were colored yellow or white, and denoted a downtown option, as opposed to a bypass. 1926 MUTCD square fonts, as seen on Route 66 and other classic highways of the golden age of motoring. U. S. shield, run off on an old press using the original dies. 1948 MUTCD round fonts. Louisiana U. S. shields available in traditional white with black legend, and various colors, as used by that state. Available in any number, with or without glass cateye or plastic Stimsonite reflectors. Cutout U. S. shield, with 1948 MUTCD fonts. Diamond-shaped state route marker with the classic pelican and old square fonts. The sign is 18 inches on each diagonal side. It is porcelain enamel on steel, just like classic signs were made back in the day.